The AuthAnvil Password Server web interface is used for day-to-day use and management of your AuthAnvil Password Server. All users can log onto the AuthAnvil Password Server Web Interface, but in order for a user to be able to access admin functions, they must have the "Organization Administrator" privilege, granted when their user is created or at any time through the "Manage user" page. Enter your username and password. Or, if your are configured to use AuthAnvil Two Factor Auth, your AuthAnvil passcode. Your passcode is comprised of your PIN and the next One-Time password from your token. ie. 123484449545. 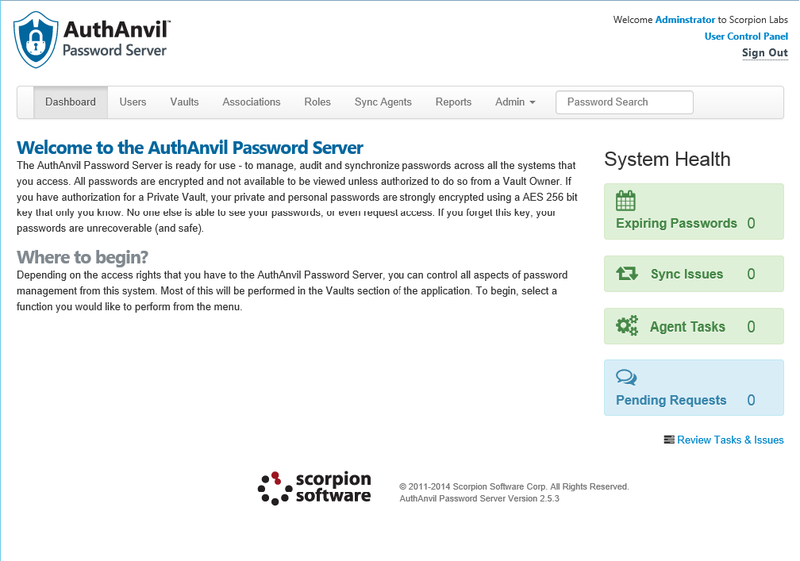 After completing the authentication, the AuthAnvil Password Server's Dashboard appears. The dashboard gives you a brief overview and introduction to the system. On the left side you will see your favorite passwords, if you have marked any as your favorites with the blue star. The right side has a list of what tasks are available for you to complete, such as updating passwords and reviewing password requests. The "Password Search" bar is a quick tool to scan through all of the passwords you can access and will return a list of matching search results. Everyone who needs to login to AuthAnvil Password Server requires a User. Each username is unique as it is tied to a specific email address. This email will be used for logging in as well as for user notifications (i.e. password expiry, requesting access, permission approval). Adding new users is done from the Users tab. Just hover over the actions menu and click Add User. Requires two-factor authentication to login: The user does not use a password, instead using AuthAnvil Two-Factor Auth to log in. Allowed to maintain a Private Vault: The user is allowed to maintain a private vault, where they can keep private passwords. See the section on Private Vaults later in this document for more details. Allowed to create Shared Vaults: The user is allowed to create and manage new shared vaults. This permission implies the "Allowed to own Shared Vaults" permission. Allowed to own Vaults and create Personal Vaults: The user is allowed to be assigned the "owner" permission for shared vaults so that they can manage them. They are also able to manage their own Personal Vaults. See the section on vault types later in this document for more details. Organization Administrator: The user is an organization administrator, allowed to manage users, settings, and sync agents, and run reports. If the administrator is also assigned the "Allowed to own Shared Vaults" permission, they can seize control of shared vaults. 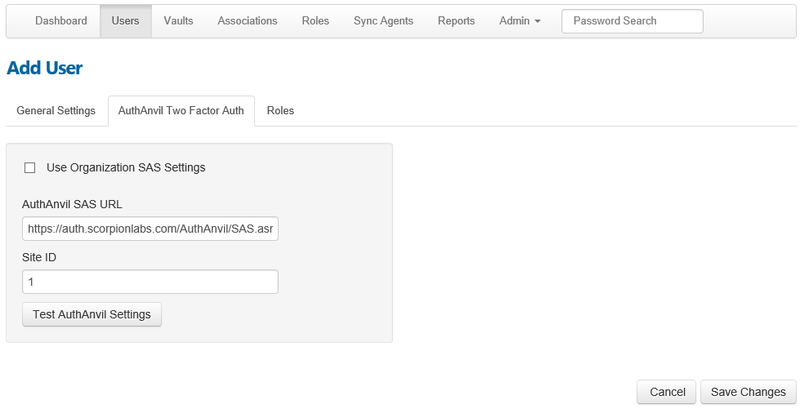 If the user is set to require Two-Factor Auth, the SAS URL and Site ID for their AuthAnvil Two Factor Auth Server can be set on the "AuthAnvil Two Factor Auth Settings" panel. 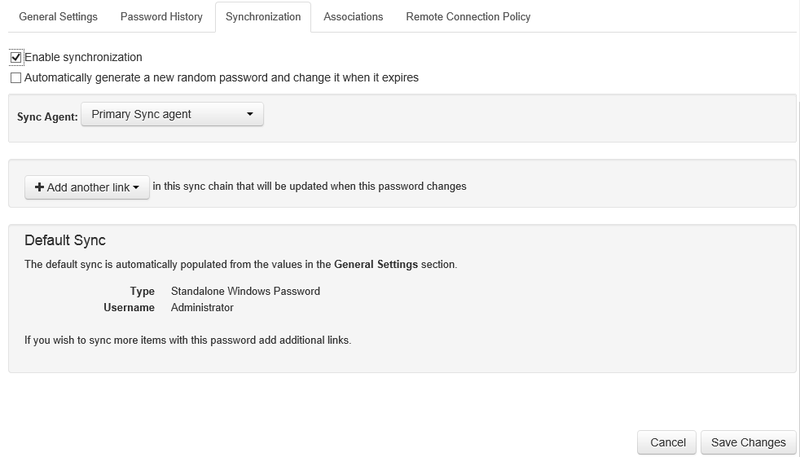 Here, you can also set the user to use the organization's Two Factor Auth settings, as configured on the Settings tab. On the "Roles" panel, the user can be assigned to one or more Roles, deciding which vaults they can see and access. NOTE: A user must be assigned to at least one Role, as Roles are directly mapped to Scopes. Finally, click "Save Changes" to create the user. Managing existing users is done from the Users tab. Just click on the username of the user that you would like to manage. General Information Tab: Email Address, Display Name, Password (if enabled) user permissions, and whether the user is enabled or disabled. Roles: Which Roles the user is assigned to. Actions menu: Delete the user. Roles provide an easy method to apply configuration to a large group of users, rather than to each user individually. Scopes and Vault permissions can be applied to Roles to allow visibility and access control to specific user templates, such as "Administrator", "Technician", and "Client". Users can also be assigned to multiple roles, and they will always take the best policy available to them. For example, if you create an "Admin" role which has access to the "Administration" scope, but the "Users" role only has access to the "Default Scope", a user assigned to both roles will have access to both scopes respectively. Roles were introduced in AuthAnvil Password Server v1.6. Any customers upgrading from earlier versions will automatically have a role created for each individual scope, mapping up the current scope members with access to that scope. Adding new roles is done through the Roles tab at the top of the page. Hover over the Actions menu and click Add Role. The "Scopes" panel determines which Scopes this role is able to see. All members of this role will be able to see every vault bound to these scopes. Assign users to this role through the "Role Members" panel. All users will be listed here. Simply check the boxes for the users that will be assigned to this role. Click "Save Changes" in the bottom-right corner to create the role. Passwords are stored and managed inside vaults, with users' level of access to them depending on the permissions that are assigned at the vault level. Open a Vault, and click "Add Password" under the Actions menu. Password Name: A friendly name for the password. Note: This does not have to be the same as the password's username. Description: A description of the password. Password Type: The category of password that this falls into. If you do not see the password type, then just set it as a General Password. Note - Most password types are informational, meaning they do not have a special affect on the password. Windows and Web password types (i.e. Active Directory Windows Password) will provide additional functionality or fields, as outlined in the rest of the guide. Days to Expire: How many days before this password is expired and flagged for change. If this value is set to 0, the password will never expire. Expire X Minutes After Access: After a user reveals or copies this password, wait this many minutes to automatically rotate this password or flag it for manual expiration. This also applies to passwords accessed through RDP or Web Launch icons. If this value is set to 0, the password will never expire. Username: The username associated with the password. This field is not displayed for types of passwords that do not have usernames. If you have a general password that does not have a username, just leave it blank. Domain: The active directory domain name associated with this password. This field is only displayed for the "Active Directory Windows Password" type. Machine Name: The name of the machine associated with this password. This field is only displayed for Windows password types. Password: Any additional notes needing to be stored with the password data. This could be special information about the connection or account. All Notes information will appear when the password is revealed on screen. Notes: After a user reveals or copies this password, wait this many minutes to automatically rotate this password or flag it for manual expiration. This also applies to passwords accessed through RDP or Web Launch icons. If this value is set to 0, the password will never expire. Checkboxes: There are 2 additional options. 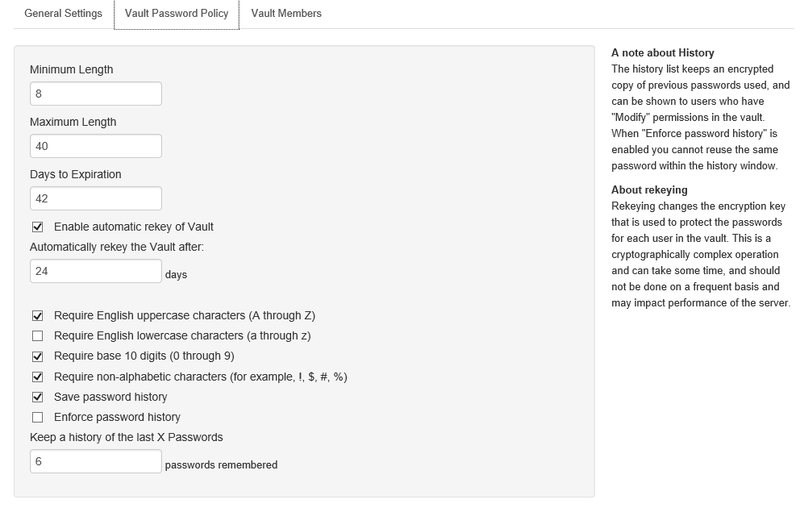 "Ignore the Vault Password Policy for this Password" allows you to save the password, even if it does not meet the necessary complexity requirements. "Do not include this Password in the 'Passwords not attached to an Association' report" excludes this password from a special report that looks up all passwords not tied to an Association. If the password is a synchronizable type of password, such as a Standalone or Remote Windows Password or an Active Directory Password, you can set up synchronization settings in the synchronization tab following the instructions in the "Synchronizing Passwords" section below. Click Save Changes to save the password. Password Server allows you to create customized password policy templates to control the complexity requirements for your passwords. Many websites have specific requirements or limitations on how long or short a password can be, as well as what characters are acceptable. Password Policies allow you to define the specific complexity requirements for each password to make sure they stay within the boundaries of your user account. Rotating passwords tied to a policy will also automatically generate based on those constraints to properly adhere to the security policy for the account. 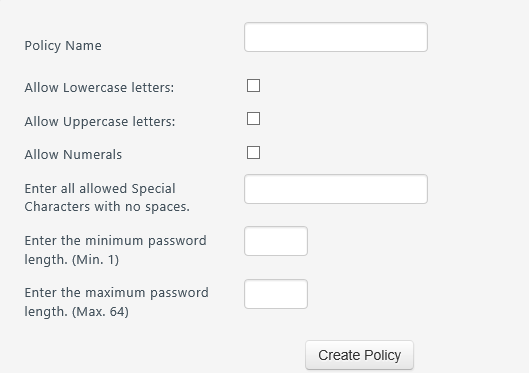 To unassign a password policy from a record, select "Optional: Choose a Password Policy" from the policy dropdown list. You can create your own Password Policies on the "Settings" tab at the bottom of the page. There are multiple premade templates available to use right away with preset ranges for password length and allowable characters. To reveal a password, a user with "Read" permissions or better to the vault can open up the vault and click the "Reveal Password" button. Users that have the "Requires Approval" permission set first need to follow the instructions in the "Requesting Access to Passwords" section below. A user with "Modify" permissions or better can click on the password's name to modify it. General Settings: All of the settings available in the General Settings panel of Add Password, including, Name, Description, Type, Expiration, Username, Domain Name, Computer Name, and Password. Password History: Previous password history will be shown here if password history is enabled in the vault, and the "Allow previous password history to be shown" setting is set at the organizational level. Synchronization: Synchronization settings which can be set based on the instructions in the "Synchronizing Passwords" section below. Delete Password: Deletes this password and its history (if enabled) from the vault. This operation cannot be reversed. The user logs into the vault and clicks the "Request Approval" button beside the password. This sends an approval request to the vault owners. When the owner logs into the vault, they will have a task in their task list letting them know that a password request is pending and that they have to review it. The admin then clicks on "View Password Request"
The administrator can then either approve or deny the request. If they decide to approve it, they can set an expiry date for the user's access, have the option to change the password before approval, expire the approval when the password expires, and can have the system automatically generate a new password when the approval expires (if the password is synchronized), then click Accept. If the administrator approves the request, the system will send an email to the user letting them know that their request was approved. The user can then log in to the vault and view or modify the password as their permission level allows. 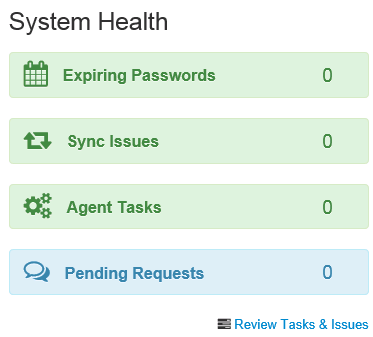 The Sync Agents tab displays all of the sync agents that are currently authorized for use in the AuthAnvil Password Server, as well as showing any pending sync agent requests. After a Sync Agent has been installed on a machine, and goes to check into the AuthAnvil Password Server, it will appear in the Sync Agents tab as a pending agent. From here, you can click Approve to configure the agent for use with the AuthAnvil Password Server, or Deny to deny the request and remove the agent form the list. General Settings: Set a friendly name for the agent in the Agent Name field, and optionally set a new password for the agent. If you set a password for the agent, you will need to enter this password on the agent side before the approval process can complete. This is typically only required if you need to verify the identity of the computer that is making the request. Scopes: Choose one or more scopes for this Sync Agent to be available to. Linked Credential: For synchronizing passwords that require an administrative credential to be provided, such as Windows Tasks, you can set a credential to use for these password changes here, picking it from the passwords available in the system. When ready, hit Save Changes to approve the Sync Agent request. General Settings: Change the agent name, and enable or disable the agent. Scopes: Change the scopes that this agent is assigned to. Linked Credential: Add, change, or remove the linked credential that is assigned to this agent. Delete Agent: Permanently remove this agent from the system. When ready, hit Save Changes to save changes to this Sync Agent. The AuthAnvil Password Server collects a wealth of data on users, vaults, and passwords. It makes this data available to administrators through the reports tab for all users, tokens, and vaults, and to vault owners and auditors for the vaults that they control. Each report can be exported to a CSV file for storage or import into other tools. Top 10 passwords accessed in the last 30 days: Displays password name, description, last access date and the vault for the top 10 most accessed passwords. Last 10 passwords accessed: Displays password name, description, last access data, accessing user, and the vault for the last 10 accessed passwords. Top 10 users in the last 30 days: Displays Name, Email address, status, last login, last login failure, and the option to run a permission report for the top 10 users. What passwords can a user see? Per user report displays the password name, description, read permissions, last access date and vault for all of the passwords that the user can see. What passwords has a user seen? Per user report displays the password name, description, read permissions, last access date and vault for all of the passwords that the user has seen, even if the user no longer has access to the password. What passwords does a user still know? Per user report displays the password name, description, read permissions, last modified date and vault for all of the passwords that the user has seen, that have not changed since the user has seen them, even if the user no longer has access to the password, with the option to expire all of the passwords that the user still knows. What has a user been doing lately? Per user report displays the user's action, a detailed message and the timestamp of the action for the user's last 100 actions over the past 30 days in the AuthAnvil Password Server. What vaults have been created recently? Displays the event information, user, vault and event time for up to the last 100 vaults created within the last 30 days. What vault settings have changed recently? Displays the event information, user, vault and event time for all of the vault settings changed within the last 30 days. Which vaults have been exported recently? Displays the event information, user, vault and event time for up to the last 100 vaults exported within the last 30 days. What permissions have been granted for a vault? 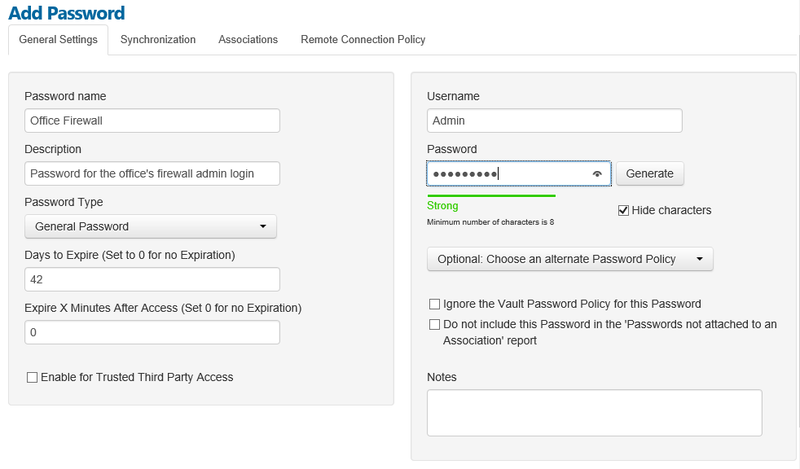 Per Vault report displays displays the users and their permissions for the vault. What passwords are about to expire? Displays the Password Name, Description, Last Modified Date, Days since the last change, days left, password expiration settings, and the vault, for passwords that are about to expire. What passwords are out of sync? 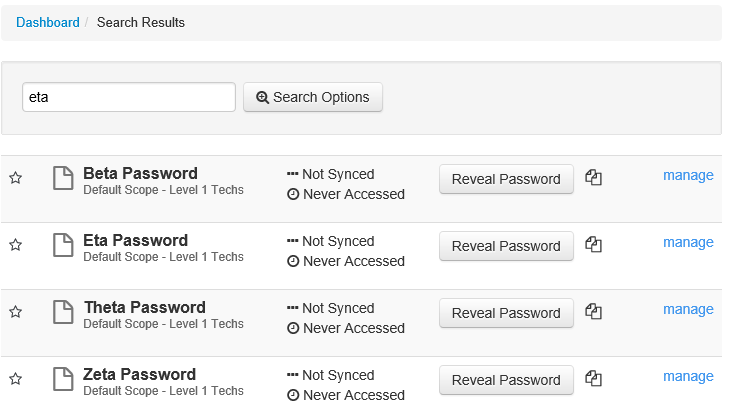 Displays the Password name, Description, Last Modified Date and Vault for any passwords that are out of sync. 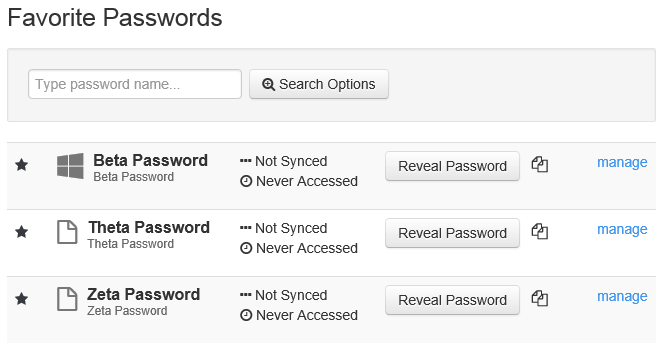 What passwords are not being synced? Displays the password name, description, last modified date, and vault for any passwords that are not being synchronized. What passwords have been accessed? Displays the password name, description, access time, status message, last accessed time and vault for all of the passwords that have been accessed by users. What permissions does a user have? Per user report on what permissions a user has assigned to their account, and what permissions they have for each vault that they have access to. What permissions have changed recently? Displays the event information and time for up to the 100 most recent permissions changes within the past 30 days. Who received password approval recently? Displays the password requested, vault, requestor, reviewing owner, and time of up to 100 of the most recent approved password requests over the past 30 days. Who was denied password approval recently? Displays the password requested, vault, requestor, reviewing owner, and time of up to 100 of the most recent denied password requests over the past 30 days. When have passwords been revealed lately? Displays charts of the frequency and timing of password reveals over the previous day, month and year, which are regenerated hourly by default. Which accounts seem to be inactive? Displays the Username, last activity date, last successful logon, and last logon failure for users that have not logged on within the past 30 days, including those users who have never logged on. Which accounts have failed to logon recently? Displays the Username, last activity date, last successful logon, and last logon failure for up to the past 100 failed logons over the past 30 days. What administrative activity has gone on lately? Displays the user, event and timestamp for all administrative activity that has occurred over the past 30 days. Token Lockout Threshold: determines how many failures are allowed before a user will be locked out. A value of 0 means that the AuthAnvil Password Server should never lockout the token. A typical value of 5 attempts will allow a user to recover for an input error while preventing an attacker from probing the server in too much depth. Token Lockout Duration: this determines how long (in minutes) a user will be locked out (disabled) before it can be used again. A value of 0 means that AuthAnvil should never unlock the token, requiring an administrator to unlock it manually. A typical value of 15 minutes will allow a user to recover from a failure while preventing an attacker from probing the server in too much depth. Allow the use of Private Vaults: determines whether or not users in this organization can be assigned the "Allowed to maintain a private vault" permission. NOTE: Users that already have private vaults assigned will lose access to them if this setting is unset. Passwords in these will not be deleted, and the users will regain access to them when this permissions is re-enabled. Allow Vault members who can Read to export content to CSV (in clear text): determines whether users with the read permission are allowed to export the contents of the vault into a clear-text CSV file. NOTE: Users with Requires Approval Assigned cannot export vaults. Allow previous password history to be shown: If a vault is configured to keep password history, this options determines whether users with the modify permission are allowed to see a list of the previous passwords when they go into the modify password page. NOTE: If this option is turned off, password history is still kept as per the vault settings. Users just aren't able to see it. Mail Server: defines where AuthAnvil will send email messages for alerts and enrollment requests. This should be a resolvable name or IP address to a working SMTP (mail) server that will allow the AuthAnvil server to relay messages. The Test button will attempt to send an email via the mail server to the email address set on this dialog. Email Address: This sets the From Address. This field defines who the email will be sent from, such as 'authanvil@yourdomain.com'. NOTE: This email address is also the email address that the server will send any administrative emails to, so make sure that it is a mailbox that is checked regularly. Use SSL: determines whether or not the server will attempt to use an SSL connection to communicate with the mail server. SMTP Server Requires Authentication: If the mail server does not allow anonymous access, authenticated SMTP is also supported. Server Port: The port that the SMTP server is listening on. Username: The username of the SMTP user. Password: The password for the SMTP user. AuthAnvil SAS URL: The SAS URL of the AuthAnvil Two Factor Auth server that you would like your users to authenticate to by default if the "Requires Two-Factor Authentication" setting is set for the user. This setting can be changed on a per user basis. Site ID: The Site ID of the AuthAnvil Two Factor Auth server that you would like your users to authenticate to by default if the "Requires Two-Factor Authentication" setting is set for the user. This setting can be changed on a per user basis. Enable Single Sign-On: Enable Single Sign-On via SAML to the AuthAnvil Password Server. This feature will work with any identity provider that supports SAML 2.0. Issuer: Allows you to specify the issuer of the certificate used for SSO. Identity Provider Login URL: The URL of the SAML Identity Provider's login page. Identity Provider Logout URL: The URL of the SAML Identity Provider's logout page. Import New SSO Certificate: Import a new SSO Certificate. Require all users to sign in with an AuthAnvil strong two-factor authentication credential, or use Single Sign-On: Disables the use of passwords for login to the AuthAnvil Password Server. Users that currently have passwords will be allowed to use them until an administrator switches them over to use Two-Factor Auth. NOTE: When a user is in this state, they will not be able to change their password. Here, administrators can add and remove scopes. Scopes are used to organize users and vaults. Vaults are assigned to one scope each and users are assigned to one or more scopes. Users can only see vaults in scopes that they are members of. Scopes can only be deleted if they have no vaults as members, and have no users exclusively assigned to them. This section allows administrator to set the default password policy for new vaults. Subscription Username: The username for your subscription account in the Scorpion Software customer portal. Subscription Key: The subscription key associated with your subscription account in the Scorpion Software customer portal. Organization Administrators have access to special import and export tools to manage the data in the AuthAnvil Password Server. Bulk User Creation: Automatically populate users and roles through the form builder. Also able to import XML files generated by "Export Users & Roles" under the Complete Exports tab. Bulk Vault Creation: Automatically populate vaults through the form builder. Also able to import XML files generated by "Export Vaults" under the Complete Exports tab. All Vaults created with the form will use the Default Password Policy defined on the Settings page. 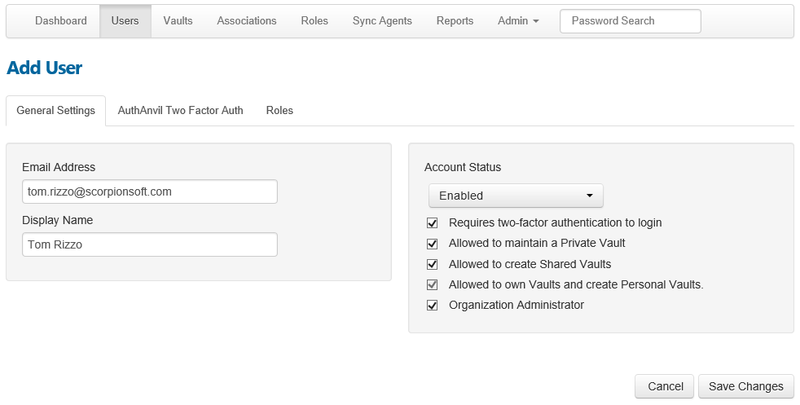 Any user that creates a Vault will automatically be assigned Owner permissions for full access. Bulk Password Creation: Able to import XML files generated by "Bulk Password Export". Master Import Tool: Exports all of the shared password data in clear text. Includes all of the details in the password record as well as the name of the vault containing it. NOTE: All Exports that affect passwords will notify all of the owners of each respective vault via email that the data has been exported. Export Vaults: Exports all of the password data in CLEAR TEXT. Includes all of the details in the password record as well as the name of the vault containing it. Export Users & Roles: Exports all of the user and role data mapped up with specific scopes. Data can be re-imported using "Bulk User Creation" under the Import Tools tab. Export Total: Exports all of the following data: Users, Roles, Scopes, Permissions, Shared Vaults, and CLEARTEXT passwords. It will not export private or personal vault data, Sync Agent data, or audit reports. The user control panel is accessible by clicking the "User Control Panel" link in the top right hand corner of the screen. It displays information about the currently logged in user, including their assigned privileges, which vaults they have access to and what permissions they are assigned to eact of those vaults. If the user is set to use a password for login to the AuthAnvil Password Server, rather than two factor authentication, they can also reset their password here. If you have passwords that you would like to use more often, you can make use of the Favorites feature in the AuthAnvil Password Server. Flagging a Password as a "Favorite" makes it appear on your Dashboard, the front page when you first log in. Inside a Vault, simply click on the grey star under the "Favorite" column and this password will be flagged as a Favorite. Favorites are marked with blue stars. You can configure up to 10 passwords this way.